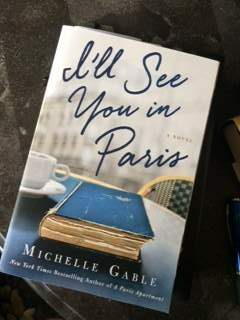 I’ll See You in Paris: Book Review By Arlene. 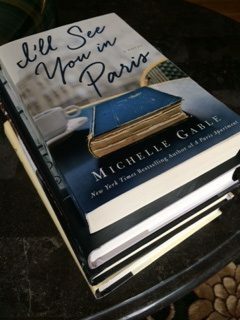 I’ll See You In Paris is a perfect, interesting, and fun summertime read for on the beach, laying by the pool or sitting on your deck chair under the umbrella…wherever you choose to pick up that one good book that will entertain and possibly educate you along the way. This novel has a very interesting story line based on fact, chock full of various young and not so young characters who will take you into the English countryside and eventually into Paris. Who does not love Paris?? The dual narratives are not hard to follow throughout the book and I found them to be actually helpful as I followed the story along throughout the book. I also found the short chapters to be a real help in reading this interesting book. “The Blue Book” on the front cover of the novel is a the core of the novel story. As you begin reading, keep in mind this book is about a real person. Historical fiction is always a great lesson. While packing for a trip with her mother to England a young woman stumbles upon a mysterious old book that seems to hold many answers to her mother’s life. Her mother is an attorney, going to England to settle some issues that are stopping the closing on a piece of property she has inherited and wants to sell. Therein the story begins and transports the reader into discovering , as the back cover of the book states, the rich and storied real life of Gladys Spencer-Churchill the Duchess of Marlborough. Nearly a century after Gladys’s heyday, a young woman’s quest to understand the legendary duchess takes her from a charming hamlet in the English countryside to a dilapidated mansion kept behind barbed wire and ultimately to Paris. In the end, she not only solves the riddle of the Duchess, but also uncovers the missing pieces in her own life. The ending of the novel holds several surprises you would not see coming. That being said, I enjoyed reading this novel. I felt Michelle Gable created an historical fiction story line that will keep the reader engaged throughout the book until the very last pages. The surprising plot twists toward the end of the book were surprising and, in my opinion, not expected. I felt they added to the interesting plot and contributed to the understanding of the 3 women in the story and why they made the decisions that contributed to the ending. There is a lot going on in this novel that will keep you turning the pages and feel it was well worth your time. This novel is a study also in the always deep and emotional relationship of mother and daughter. I feel women most always feel like, I love my mother but who is she really? What was her young life like? What drove her to make the decisions she made in her life? Do we feel we want to be like her or are we, as daughters, driven by the mystery and decide we will live our lives differently and not follow our mother’s ways? Don’t we all as daughters feel at the end of our mother’s life we would all appreciate knowing who she really was and what did she feel in her life would teach us to possibly make decisions in our life that would help us be happy and feel her love for us as we live out our own lives? Sometimes when you are reading a dual narrative novel with multiple characters it is hard to follow. “I’ll See You In Paris” , in my opinion, is not that kind of novel. It was an enjoyable read and will keep you wanting more. Not fluff!! I feel that an author who can keep you turning the pages until the end of the book deserves our attention. Gable concluded the story until the very last pages leaving the reader looking forward to her next book. 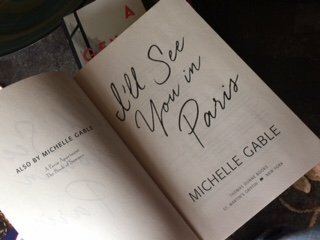 I liked this book very much and feel Michelle Gable did a great job in educating us about this mysterious woman. She will seem a little crazy to you …maybe a lot crazy…but in the end you will never forget who she is. I look forward to reading another Michelle Gable novel in the near future. Check out our book club discussion questions for I’ll See You In Paris! Hmmm…Now I’m wondering what kind of a woman my mom is. =) I love books with characters that can draw you in. Sounds like Gable was very skilled in that. Great review! Hi Lonna Michelle Gage did a great job keeping the mom in the background of this storyline of this book although she becomes the major character which drove the book in the end. I think every daughter feels so many emotions about our mothers while growing up and most especially as we grow older. I’m glad you enjoyed this book! It definitely seems like a great summer read, and I love reading historical fictions. It sounds like the dual perspective worked for this one, and I love that you couldn’t predict the surprising plot twists! I am currently reading a historical fiction based on an actual person and it always intrigues me to learn more about a person through their own/other characters eyes. Hello Emily I enjoyed reading your thoughts on your mom…I agree sometimes those facial expressions tell it all…I also had 2 grandmothers and a great grandmother who were a mystery…but in those days that is the way it was in my family and now when I look at the old photos of my mother and grandmothers I find myself wishing I could have learned more about them. Thanks for your comments. Hi Olivia I feel the way you do when reading historical fiction. I find when finishing those books those facts we learned while reading tend to stay with us and always gives a clearer picture and understanding of those time periods. Nice to hear from you as always! I… don’t really feel like that about my mother. I mostly get her, even if she doesn’t always get me. She’s pretty open, and when she’s not her facial expressions/red-head’s temper give her away!